M4V Converter Plus is a powerful M4V video format converter, which can convert purchased m4v videos to QuickTime MOV, MP4, iPod, iPhone, AppleTV, or audio format in high speed and great quality. It supports converting iTunes M4V rental. The only condition is your iTunes can play the M4V rental. It uses multiple-speed recording technology to record M4V, then encode to unprotected MOV, M4V or MP4 format. It has been designed for ripping DRM from M4V to convert to be playable on iPod, iPhone, PSP, Zune. It converts DRM M4V in fast speed and high quality. It can also convert any video on your iTunes library. M4V Converter Plus can also support extracting the audio from M4V files. Batch conversion is supported by this powerful m4v converter. It is very easy to use, with just a few clicks, you can successfully finish our conversion. It is a universal application, works on both Intel-based Mac and PPC-based Mac. It new adds MOV format in output presets. It is stable and same as source. Mac OS X 10.8, 9, 10, 11 and macOS Sierra10.12. Intel only. 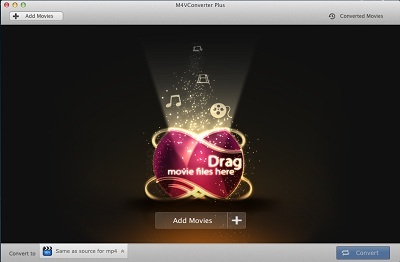 M4V Converter Plus for Mac V4.3.8 was released. 1. Fix some conversion failures. 2. Add warning prompt to indicate that the program is incompatibility with macOS 10.13 High Sierra. Top 4 Download periodically updates software information of M4V Converter Plus 4.3.8 full version from the publisher, but some information may be slightly out-of-date. Using warez version, crack, warez passwords, patches, serial numbers, registration codes, key generator, pirate key, keymaker or keygen for M4V Converter Plus 4.3.8 license key is illegal and prevent future development of M4V Converter Plus 4.3.8. Download links are directly from our mirrors or publisher's website, M4V Converter Plus 4.3.8 torrent files or shared files from free file sharing and free upload services, including Rapidshare, HellShare, HotFile, FileServe, MegaUpload, YouSendIt, SendSpace, DepositFiles, Letitbit, MailBigFile, DropSend, MediaMax, LeapFile, zUpload, MyOtherDrive, DivShare or MediaFire, are not allowed! Your computer will be at risk getting infected with spyware, adware, viruses, worms, trojan horses, dialers, etc while you are searching and browsing these illegal sites which distribute a so called keygen, key generator, pirate key, serial number, warez full version or crack for M4V Converter Plus 4.3.8 download. These infections might corrupt your computer installation or breach your privacy. A keygen or key generator might contain a trojan horse opening a backdoor on your computer. Hackers can use this backdoor to take control of your computer, copy data from your computer or to use your computer to distribute viruses and spam to other people.